A crown is a dental prosthesis that is used to cover an existing tooth in order to restore its strength, function,shape and size, as well as its appearance. It is a great method to repair a broken tooth or protect a weakened tooth from breaking. Also, a dental crown procedure is a great solution to cosmetic problems, and discolored or misshapen teeth. There are several different types of crowns, made of different materials including stainless steel, metal, ceramic and porcelain. Ceramic and porcelain crowns are the best option for achieving the natural look because their color can be matched to the color of your teeth, which is especially important if a crown is placed on your front teeth. A dental crown procedure usually takes 2 visits to the dentist. During the first appointment before the actual procedure, our dentist will examine the tooth and area around it making sure there is no infection and that is safe to perform the procedure. The local anesthetic will be administered, and the tooth will then be filed down and reshaped in order to support the crown.After the reshaping, the impression of the tooth and surrounding area will be taken so that the permanent crown can be made. At the end of the appointment, a temporary crown will be placed on the tooth to protect it from damage until the permanent crown is made. After the crown is ready, you will return to our office to have your permanent crown installed and glued to the tooth with special adhesive. 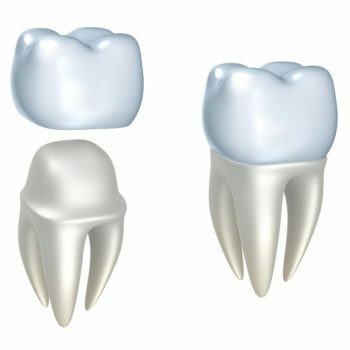 Dental crowns are very durable and can last up to 15 years! So schedule an appointment today with one of our doctors who will be more than happy to provide a detailed evaluation of your teeth and answer any of your questions. There are several different types of crowns, made of different materials including stainless steel, metal, ceramic and porcelain. Ceramic and porcelain crowns are the best options for achieving the natural look because their color can be matched to the color of your teeth, which is especially important if a crown is placed on your front teeth.